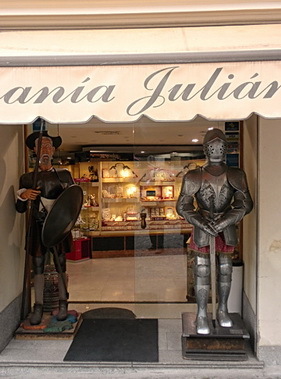 If you are in the need of some body armour from the days of the knight or a sword for your den, then Toledo is the place to go. 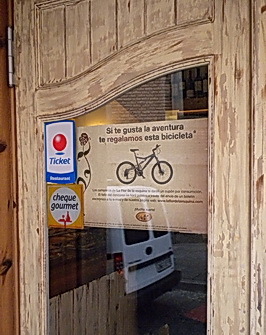 Whereas in some cities one cannot get away from gasoline stations, so is it in Toledo where every few stores along the cobbled, medieval streets, they sell swords. If a store does not sell swords, then they sell marzipan. 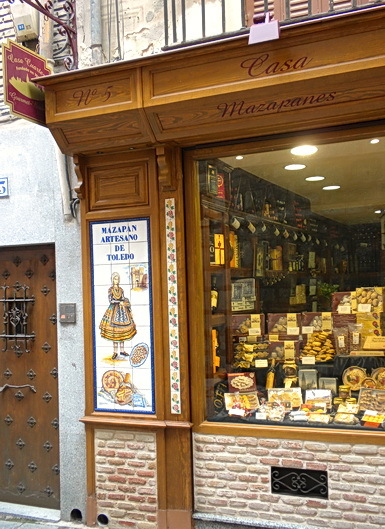 Not just any marzipan is sold, but Toledo marzipan. As someone who grew up from early age, and (from Germany, a place also known for marzipan tradition) who knows the taste and quality of marzipan, I would have to say that Toledo marzipan is the real thing and good. Food lovers who are enamoured with U.S. style portions of meals, will discover at Toledo restaurants, that they will want to order more than one plate. I was struck by the small portions of servings in restaurants. That is good. Besides that, one is full after eating the good quality food served. Tonight it was a cheese torte. Not sure what type of cheese served but would guess that it was a combination of goat and sheep cheeses, good, strong on taste but not overpowering, yet mellow to the lips. 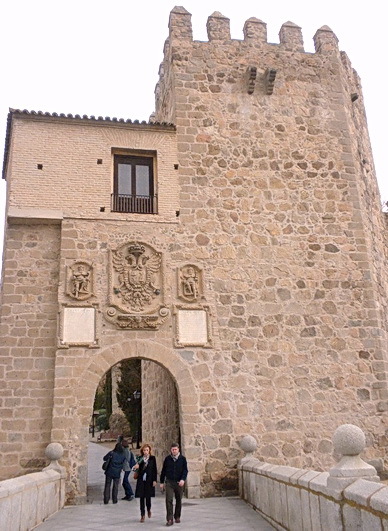 Toledo is a medieval city within fortress wall, founded in the 7th century, BC. There is a bit of a history to this city now housing about 80,000 people. The city is perched on a hill with a rise of 50 or so metres within its walls. I quickly learned that walking in the rain and wearing stiff cycling shoes on cobble stone roads was not the smartest thing to do as I was slipping walking the upward incline of streets finished with small stones perching upward to the sky. Now, the glass of wine with dinner did not help the descend back to the hotel. 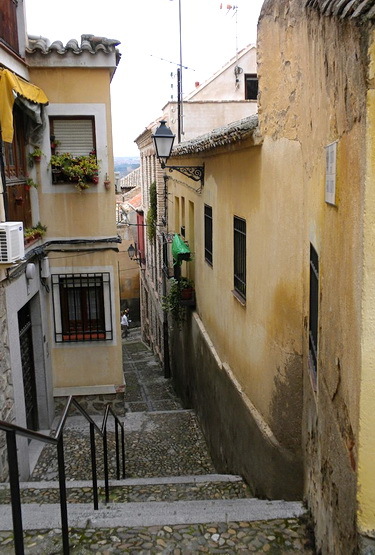 The walled area of the Toledo is about 1 to 1.5 metres in cross-dimension. When climbing to one of the higher perches of parks overlooking the city, one cannot be but amazed at the number of churches within the fortified walls. Where there so many people crowded into the protected part of the city to support the number of churches present. These stone churches were not small with high rising steeples. Brick-walled buildings filled in part by fieldstones seem to be the predominant architecture. Doors reflect the mediaeval times of the past –heavy, solid, and ornate. The streets are tiny with too many cars hurling down the cobbled pavements. Some streets become passageways. One has to be amazed by the effort it would have taken animals and people carrying the supplies for the day up the hill to the residences at the top. Occasionally, one comes across a poorly maintained building falling apart. It is a loss since the fill-in brownstone replacements are not architecturally at the same level of the original buildings. with clean-walled buildings and well-maintained streets. It is certainly worth a stop for a few days. 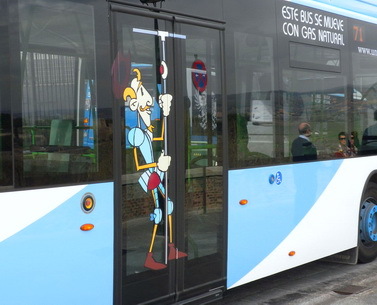 I passed through Toledo too a long time ago. Beautiful place, shame it has so many problems – massive unemployment for one.